Author, songwriter, TV producer and presenter. He was originally a cameraman in RTE but was also Folk correspondent for Spotlight Magazine and gigged all over Ireland as a singer of funny songs during those crazy days of the Showband Phenomonen and The Ballad Boom. 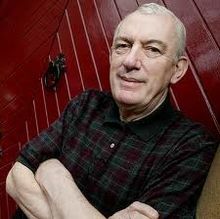 He also wrote for Danny Doyle, Paddy Reilly, Johnny McEvoy, The Wolfe Tones, Maeve Mulvany, Maura O’Connell, The Emmet Spiceland and The Johnstons. This evening will include songs such as Take a Walk of The Northside (..and the coloured girls go do-be-do etc.) ...Big Tom Will Make Me a Star....The Cover of The Senior Times and The Ballad of Sean Fitzpatrick.....songs and stories to help us shrug off the pain (a bit! ).